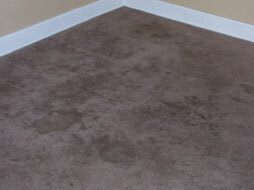 These are photos of some very soiled carpet on which I tested a new product. The owner of this home was gracious enough to e-mail me the message appearing below the photographs. We chose to include only one testimonial on our web-site. After all, even Tulsas worst carpet cleaners will eventually satisfy someone! For us, the ultimate testimonial is to be referred to others. Referrals are the backbone of our business. "I am a landlord with about 10 units that I manage for me and my relatives. From time to time, I have tenants who totally trash the carpet. 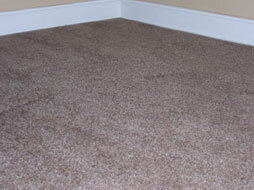 In some instances, the carpet has only been a few months old. I saw Brian Jackson's trailer at a gas station and thought I would give his company a try at cleaning one of my houses with extremely soiled carpet. I was faced with replacing the carpet for $1,500 dollars. After Brian was finished, I was extremely pleased with his service. The carpet looked brand new. I will definitely use Brian's carpet service again. He saved me a lot of money."